1. 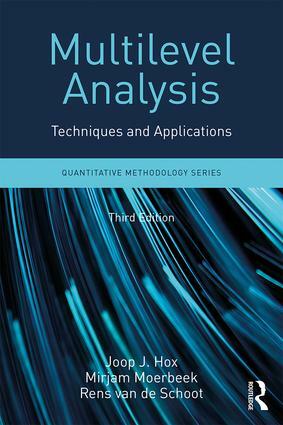 Introduction to Multilevel Analysis 2. The Basic Two-Level Regression Model. 3. Estimation and Hypothesis Testing in Multilevel Regression. 4. Some Important Methodological and Statistical Issues 5. Analyzing Longitudinal Data. 6. The Multilevel Generalized Linear Model for Dichotomous Data and Proportions. 7. The Multilevel Generalized Linear Model for Categorical and Count Data. 8. Multilevel Survival Analysis. 9. Cross-Classified Multilevel Models. 10. Multivariate Multilevel Regression Models. 11. The Multilevel Approach to Meta-Analysis. 12. Sample Sizes and Power Analysis in Multilevel Regression. 13. Assumptions and Robust Estimation Methods. 14. Multilevel Factor Models. 15. Multilevel Path Models. 16. Latent Curve Models. Appendices. Joop J. Hox is Emeritus Professor of Social Science Methodology at Utrecht University, the Netherlands. Mirjam Moerbeek is Associate Professor of Statistics for the Social Sciences at Utrecht University, the Netherlands. Rens van de Schoot is an Associate Professor of Bayesian Statistics at Utrecht University, the Netherlands, and Extra-Ordinary Professor at the North-West University, South Africa.